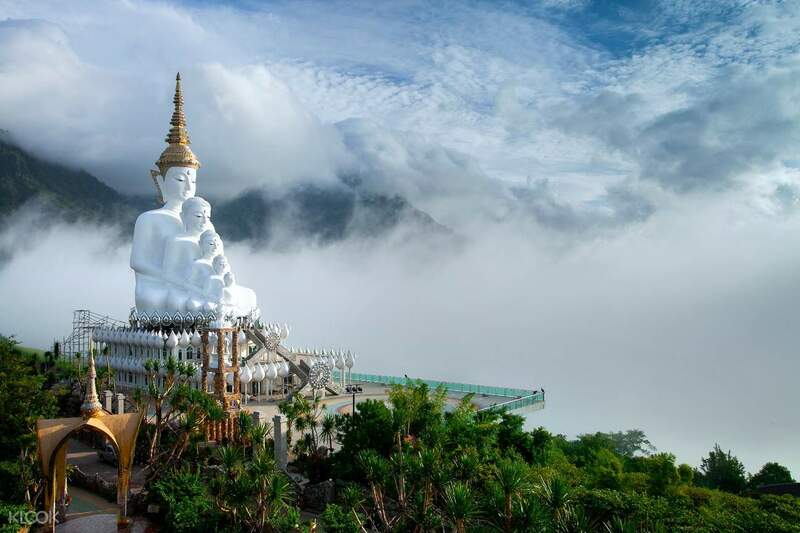 Extend your stay and discover more of Khao Kho with a 5D4N Khao Kho Private Tour from Bangkok! 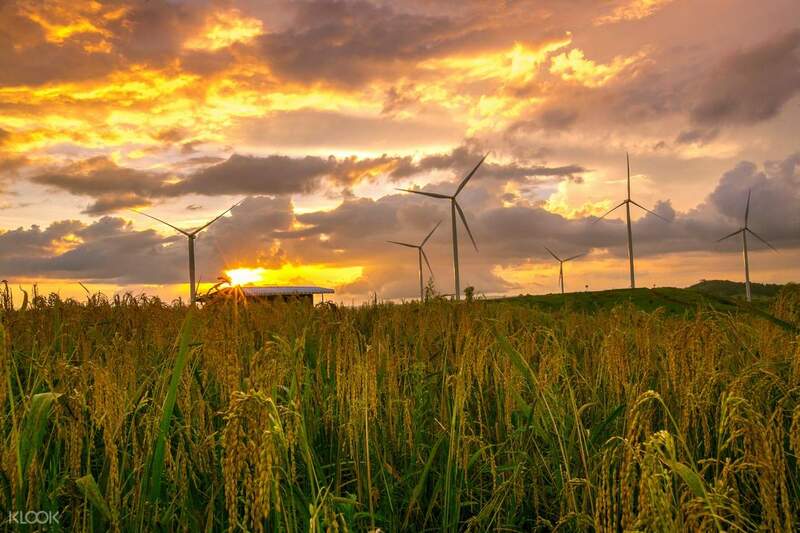 Bring out the nature lover in you and go on a private tour to the charming district of Khao Kho! Witness breathtaking scenic views of mountain ranges, hills, valleys, rivers, temples, pagodas and more. You can plan your own itinerary or you can follow the suggested destinations. 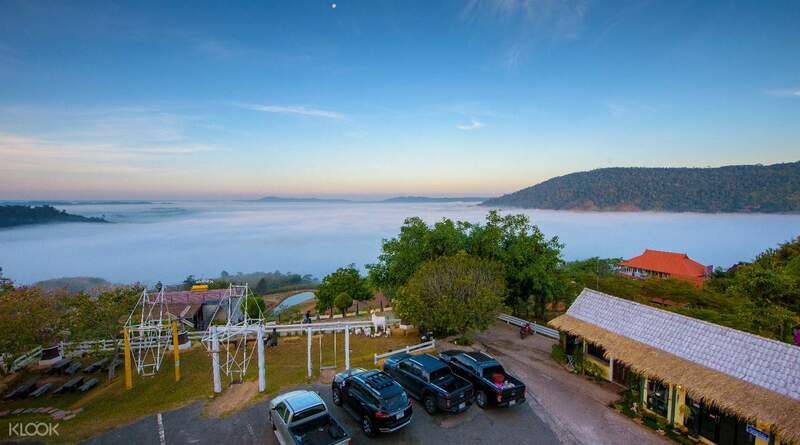 Feel like you’re on cloud nine as you climb the highest point in Khao Kho to see the spectacular sea of clouds. 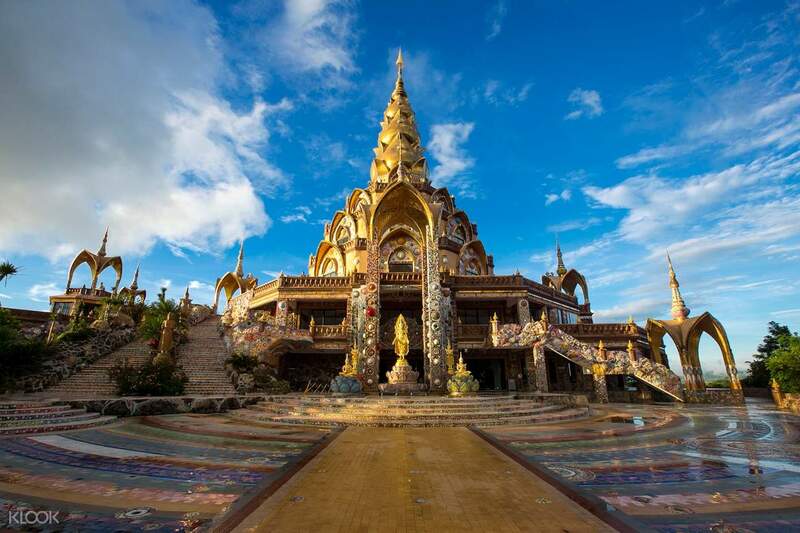 Take the chance to visit one of Thailand’s most beautiful temples, the vibrant Wat Prathat Phasornkaew and take a closer look on its intricate mosaic tiles, pottery items and other art forms. With a professional driver behind the wheel, get to all your desired destination around the area in no time. Make your experience extra memorable by enjoying scrumptious Thai food at local restaurants and cafes. We had a good getaway to Khao Kho with Klook. They gave us Toyata Fortuna for our trip. Our driver Mr Sing was very nice & patience. He planned the tour for us and on the last day, he brought us to the mountain to view the sunrise. Me & hubby enjoyed Mr Sing accompany and he is a careful driver. He also take lots of nice picture for us. Thumbs up, Mr Sing! We had a good getaway to Khao Kho with Klook. They gave us Toyata Fortuna for our trip. Our driver Mr Sing was very nice & patience. He planned the tour for us and on the last day, he brought us to the mountain to view the sunrise. Me & hubby enjoyed Mr Sing accompany and he is a careful driver. He also take lots of nice picture for us. Thumbs up, Mr Sing! We are extremely satisfied with Klook’s Khao Kho tour. The driver: Punctual and polite, he was very professional and knows his destination well. We stayed at a resort that’s off beaten track near the mountains and he’s able to navigate there well. The guide: Thankful for Klook’s initiative to provide us with a guide and showed us around the vicinity. He’s able to fit our programs well and bring us to enjoy the local experiences with our impromptu requests. 🙂 Ultimately, we would like to thank Klook for the real amazing Khao Kho experience. We are extremely satisfied with Klook’s Khao Kho tour. The driver: Punctual and polite, he was very professional and knows his destination well. We stayed at a resort that’s off beaten track near the mountains and he’s able to navigate there well. The guide: Thankful for Klook’s initiative to provide us with a guide and showed us around the vicinity. He’s able to fit our programs well and bring us to enjoy the local experiences with our impromptu requests. 🙂 Ultimately, we would like to thank Klook for the real amazing Khao Kho experience. we were happy with the services. the car was very comfortable for 2 of us. Driver Mr Tawin was nice and would drive us to where we want to visit. too bad we have missed the Sun Rise at Phu Tub Berk due to rain and road close to the mountain. we were happy with the services. the car was very comfortable for 2 of us. Driver Mr Tawin was nice and would drive us to where we want to visit. too bad we have missed the Sun Rise at Phu Tub Berk due to rain and road close to the mountain. Mr Dome was fluent with English. He had assist with translation with all the local resturant and places of interest. Overall, a very pleasant trip with Dome and Klook! Mr Dome was fluent with English. He had assist with translation with all the local resturant and places of interest. Overall, a very pleasant trip with Dome and Klook! Great location, loved the beautiful sea of clouds and gorgeous sunsets. Our guide, Mr Manote, was very helpful and took us to places with great views. Will definitely visit again. Great location, loved the beautiful sea of clouds and gorgeous sunsets. Our guide, Mr Manote, was very helpful and took us to places with great views. Will definitely visit again. reasonable rate , comfortable 10 seater van. Driver Mr Peak is friendly , careful driver, speak understandable english, give helpful advice on attraction. reasonable rate , comfortable 10 seater van. Driver Mr Peak is friendly , careful driver, speak understandable english, give helpful advice on attraction. Special thanks to KLOOK and Mr Manee for making our trip to Khaokho so amazing and full of HA HA HA. Despite visiting Khao Kho in an unfavorable hot and dry season where there is no sunflower and strawberry in the farm, Mr Manee’s enthusiasm has hyped up our spirits. Along the journey to and fro Khao Kho, he shared with us the history and facts of the places we were at like a tour guide. In addition, he even recommended and surprised us with places of interest that are out of our itinerary. He is full of ideas and takes extremely nice photos for us. Last but not least, we would like to express our special thanks to him for taking good care of us like a father, paying special attention to things we want to see and buy and finally for having fun together with us throughout the trip. Manee, hope to see you again on our next visit to other parts of Thailand, it is awesome making a new friend like YOU. Special thanks to KLOOK and Mr Manee for making our trip to Khaokho so amazing and full of HA HA HA. Despite visiting Khao Kho in an unfavorable hot and dry season where there is no sunflower and strawberry in the farm, Mr Manee’s enthusiasm has hyped up our spirits. Along the journey to and fro Khao Kho, he shared with us the history and facts of the places we were at like a tour guide. In addition, he even recommended and surprised us with places of interest that are out of our itinerary. He is full of ideas and takes extremely nice photos for us. Last but not least, we would like to express our special thanks to him for taking good care of us like a father, paying special attention to things we want to see and buy and finally for having fun together with us throughout the trip. Manee, hope to see you again on our next visit to other parts of Thailand, it is awesome making a new friend like YOU. Our driver, Mr Manee, is very accommodating, experienced and punctual driver and speaks good English which all of us understand. He suggested few places which was not included in the itinerary as well and even stop by some stalls for my parents to buy fruits every night. Had included The Louis Café but it was already closed down, perhaps Klook should update their itinerary. We reached our hotel in Khao Kho quite late and our hotel reception had already closed. After few calls and Mr Manee had also helped to speak over the phone to the hotel and we finally manage to get our room keys. Overall, a very nice and satisfying trip. Our driver, Mr Manee, is very accommodating, experienced and punctual driver and speaks good English which all of us understand. He suggested few places which was not included in the itinerary as well and even stop by some stalls for my parents to buy fruits every night. Had included The Louis Café but it was already closed down, perhaps Klook should update their itinerary. We reached our hotel in Khao Kho quite late and our hotel reception had already closed. After few calls and Mr Manee had also helped to speak over the phone to the hotel and we finally manage to get our room keys. Overall, a very nice and satisfying trip.